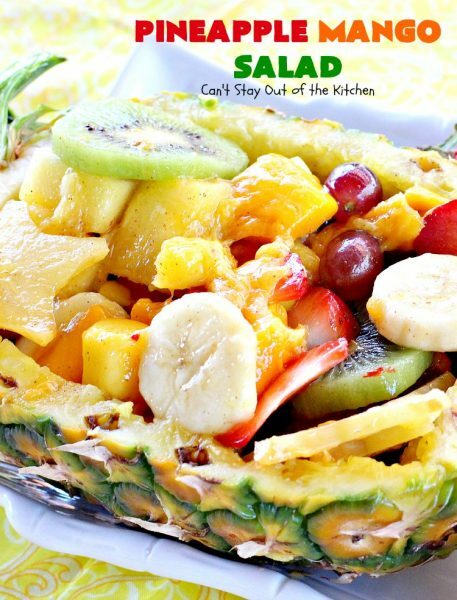 Pineapple Mango Salad is pretty special, not to mention it looks and tastes spectacular. 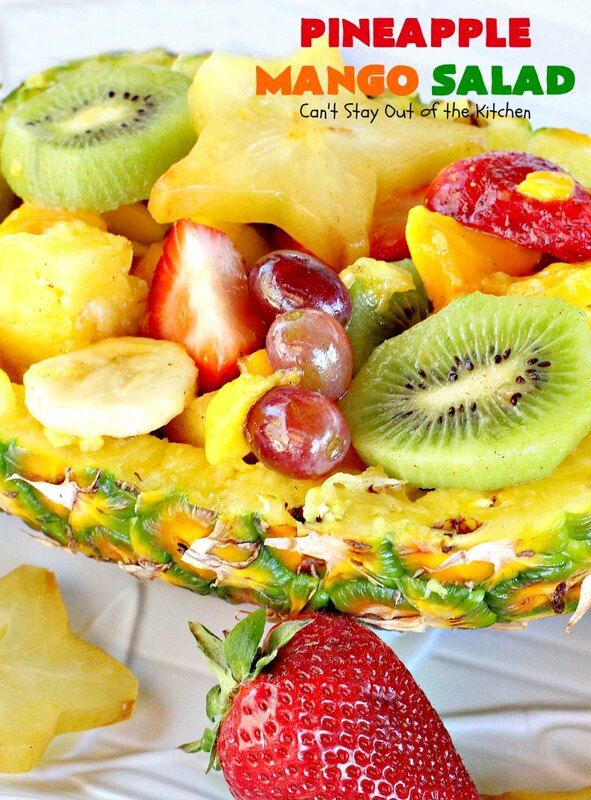 Serving it out of the pineapple shell makes it look even more sensational. It’s certainly a fantastic salad to serve during the summer when this fruit is in season. We were having company for dinner last week and I wanted to make some kind of fruit salad. Mangos had been on sale recently, so I looked online to see if I could find any kind of salad using pineapples and mangos. This recipe looked so fabulous I decided to give it a try adding a few other types of fruit. We all loved it. The dressing of honey, cinnamon and lime juice, though so simple, was wonderful to the palate, and the combination of tropical fruits with berries was mouthwatering. 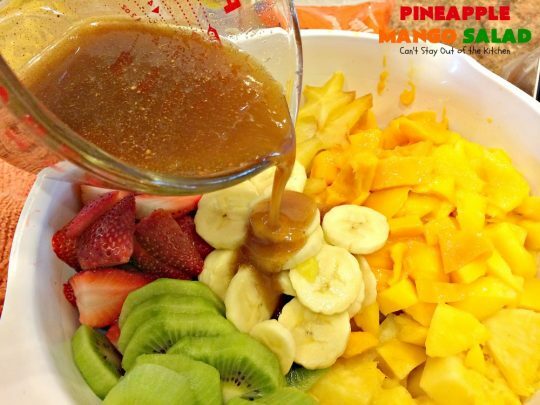 Pineapple Mango Salad is a wonderful tropical salad with a tasty honey-cinnamon-lime dressing. 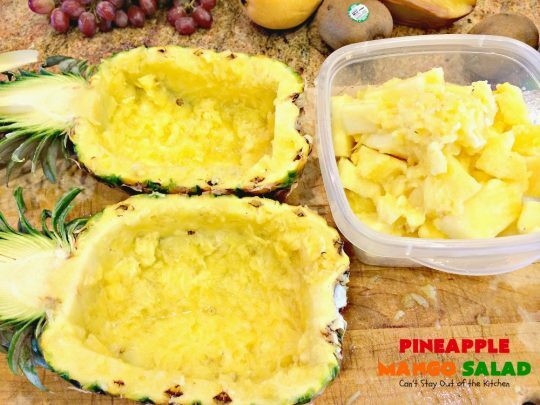 We served Pineapple Mango Salad in hollowed out pineapple shells. If you’ve never purchased star fruit before, look for one that’s yellow and brown (not green) as they will be riper and sweeter. Otherwise the star fruit may be too bitter. Ours was just right. 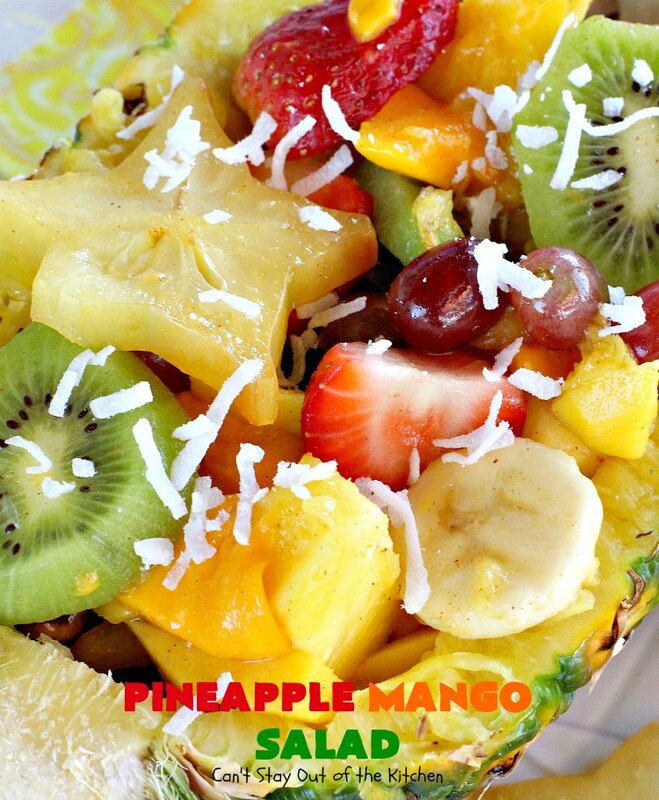 Pineapple Mango Salad is one of the best fruit salads I’ve ever eaten. On the left are the ingredients for the salad. On the right are the ingredients for the dressing and garnish. You can see that my star fruit is really yellow with brown edges (instead of green edges). Cut pineapples in half lengthwise. Hollow out pineapple halves leaving a shell. 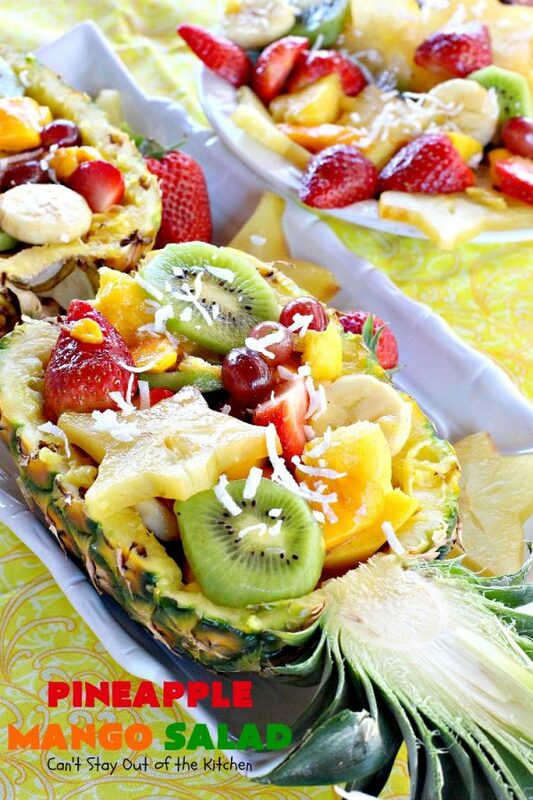 Cut the pineapple in bite sized pieces and set aside. In a mixing bowl add grapes, strawberries, bananas, kiwis, pineapple, champagne or ataulfo mangos, regular mangos, and star fruit. Mix honey, cinnamon and lime juice. Stir to combine. Pour dressing over the fruit and stir again to combine dressing and fruit. 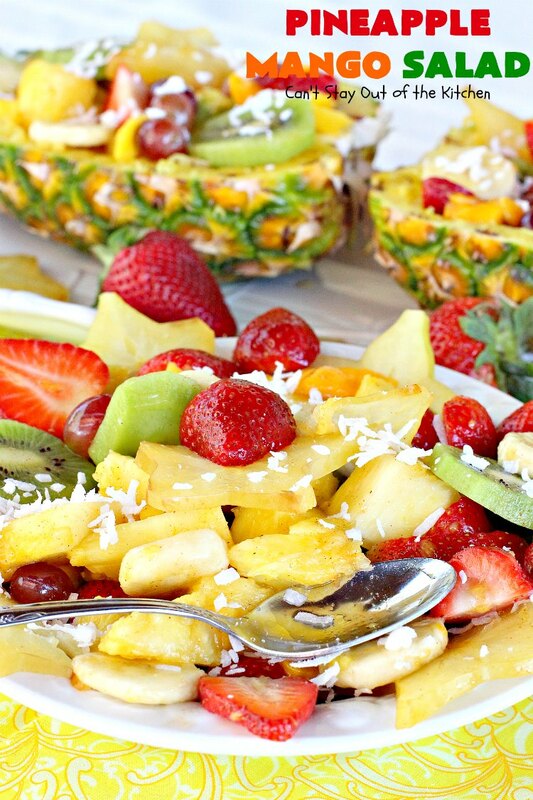 To serve: garnish Pineapple Mango Salad with coconut. Pineapple Mango Salad is luscious and amazing. This close up shows the texture of this lovely salad without the coconut. Scrumptious tropical fruit salad recipe with a honey-cinnamon-lime dressing. 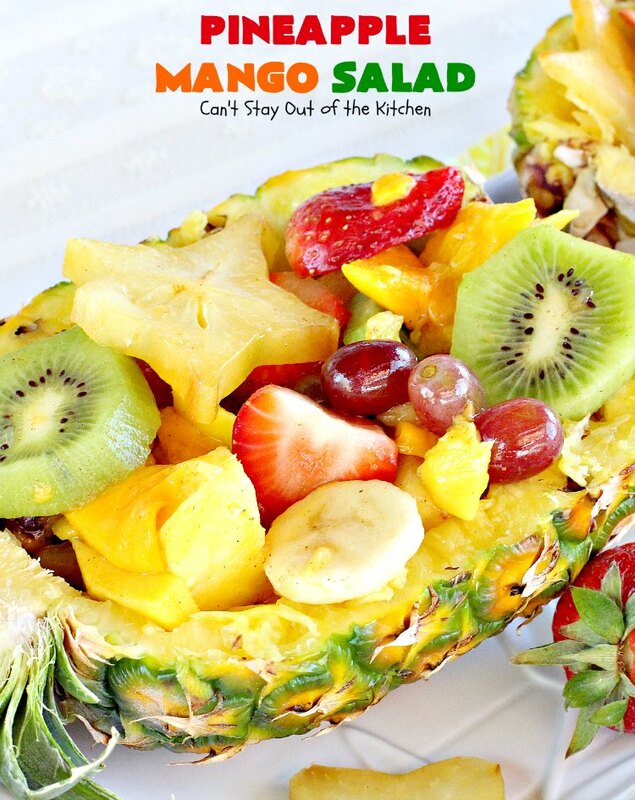 Pineapple Mango Salad is healthy, low calorie, gluten free and vegan. 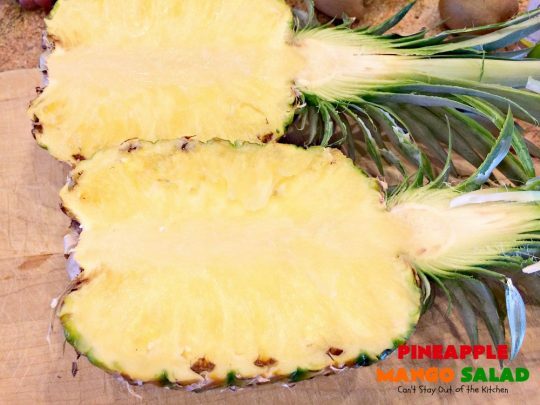 Cut pineapple in half lengthwise. Carve out the insides from pineapple halves. Save halves to serve salad in. Dice pineapple, discarding the core. 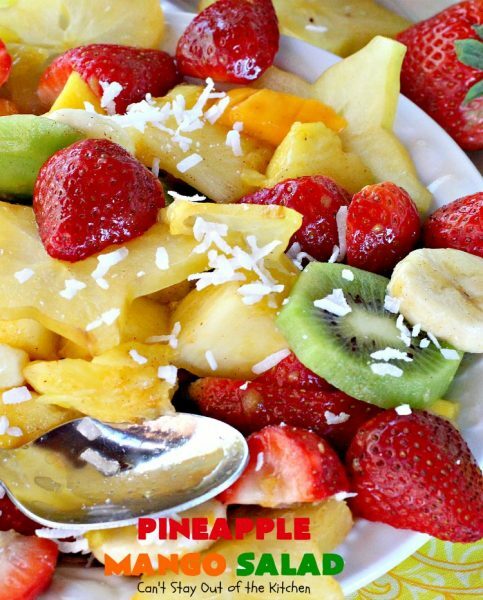 Mix pineapple, strawberries, bananas, kiwis, grapes, mangos and half the star-fruit together. In a small bowl, combine honey, lime juice and cinnamon. 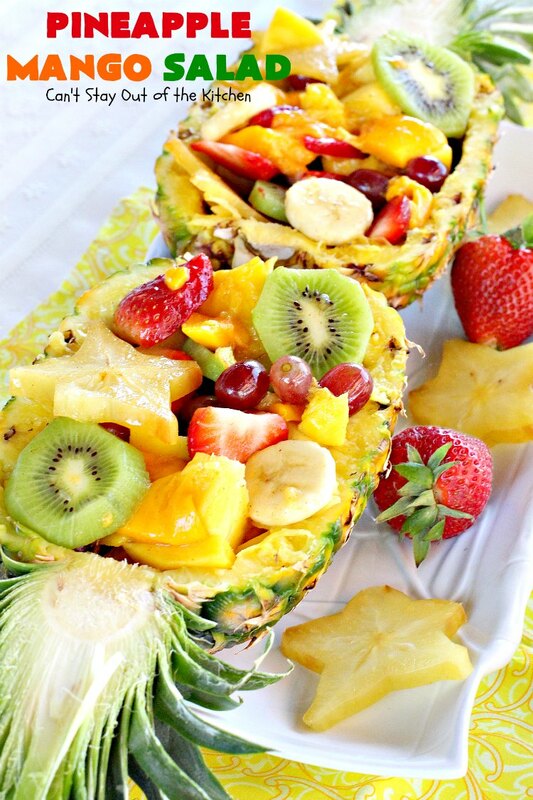 Pour over fruit and toss. Place in pineapple shell, sprinkle with coconut and garnish with mint leaves and additional star-fruit slices. Pineapple Mango Salad is healthy, low calorie, gluten free and vegan. This festive salad is an excellent choice for company and special occasions. 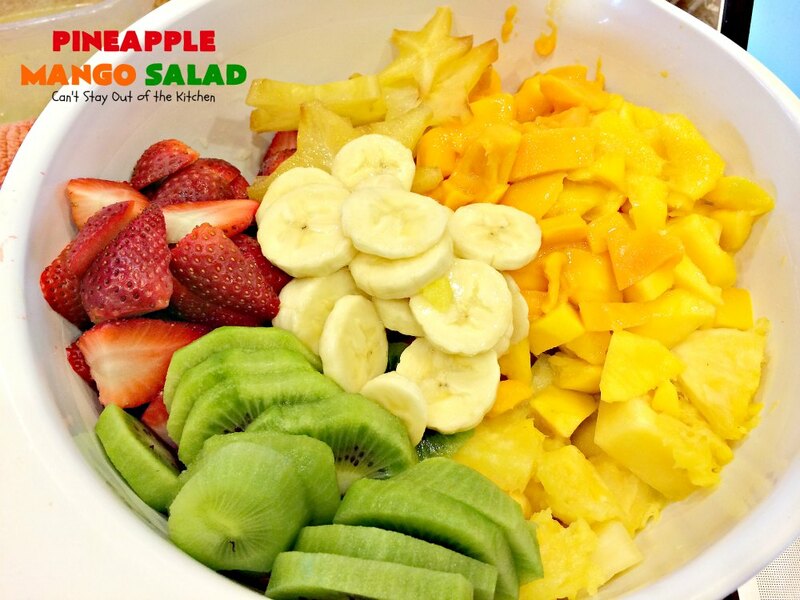 Doesn’t Pineapple Mango Salad look beautiful? Pineapple Mango Salad is perfect for holidays like Mother’s Day, Father’s Day or the summer holidays when this fruit is in season. 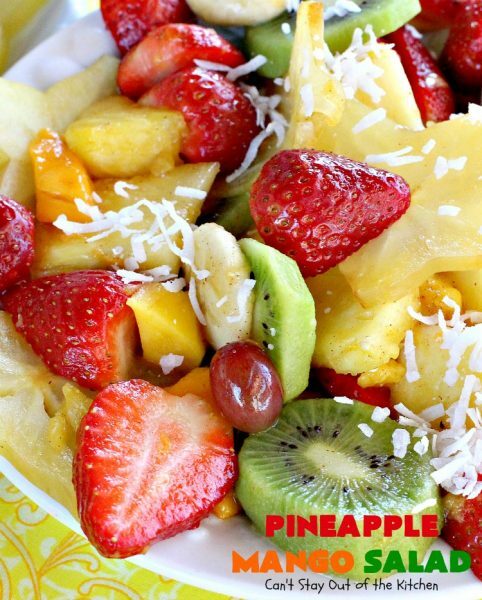 Your Pineapple Mango Salad looks really good. I just love fresh fruit. 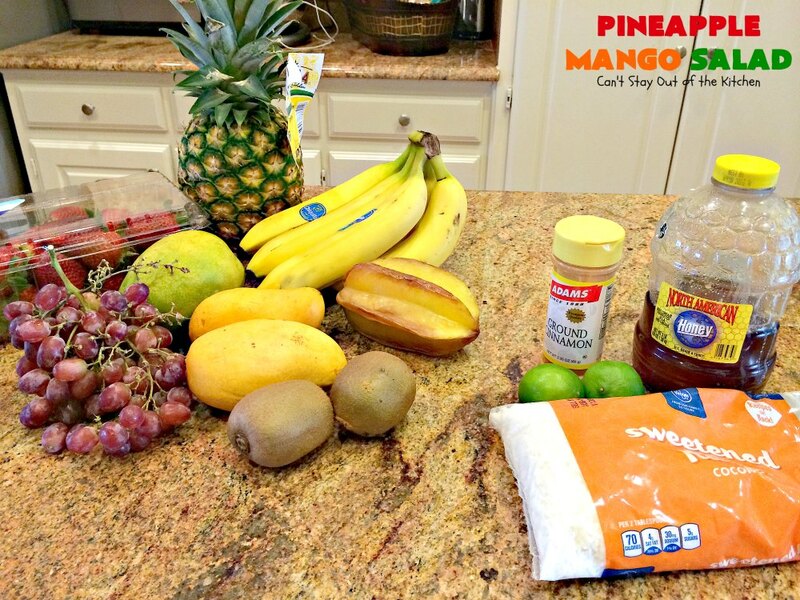 I always tell my kids eating fresh fruit is like eating God’s candy. I am featuring this recipe on Saturday Dishes this week. Thank you so much, Diane! We loved the way this turned out. I never would have dreamed that lime juice, cinnamon and honey would make this salad so refreshing but it was spectacular! I hope you get a chance to try it sometime. Your salad looks so good. I love a fresh fruit salad. I’ve always wondered how you peel a star fruit. I love the flavor of it, but have never prepared it myself. Thanks for sharing at Saturday Dishes. I wash the star fruit and peel the edges only, then slice. Thanks so much for stopping by. Thank you so much, Tamara. It was very refreshing. The honey-cinnamon-lime dressing really made this special.